A deed to real estate in Georgia is required by statute to be an original document in writing that is signed by the grantor and attested or acknowledged. It should be delivered to the purchaser or his or her representative and be made on a good or valuable consideration ( 44-5-30). The Georgia Statutes do not provide a form for a deed, as a specific prescribed form is not essential to the validity of a deed. However, the instrument should be sufficient in itself to make known the intent to convey ( 44-5-33). 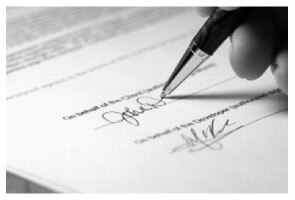 The customary form for a residential transaction is a warranty deed. Quitclaim deeds and limited warranty deeds are also used often in Georgia. In Georgia, the power to convey property is extended to any person of lawful age as well as corporations. Aliens who are subjects of governments at peace with the United States and the state of Georgia, as long as their governments remain at peace with the United States and with Georgia, are entitled to all the rights of citizens of other states who are temporarily in Georgia and will have the privilege of purchasing, holding, and conveying real estate in this state ( 1-2-11). Corporations may also convey real estate in Georgia, but there are guidelines pertaining to alien corporations ( 16-14-15).Further guidelines on who may convey property pertain to property held in adverse possession: A deed that is made while the land in question is held adversely by the maker of the deed is not void ( 44-5-43). Guidelines related to transferring real estate to minors are listed in Title 44, chapter 5 of the Georgia Statutes. The way in which property is held (i.e. joint tenants with right of survivorship, individually, et cetera) will determine the type of deed used to facilitate the transaction. Instruments submitted for recordation should be originals and attested or acknowledged as provided by law. Deeds will not be recorded unless the name and mailing address of the person to whom the instrument is to be returned is provided at the top of the first page of the deed ( 44-2-14). An instrument can be attested by a judge of a court of record, including a judge of a municipal court, or by a magistrate, a notary public, or a clerk or deputy clerk of a superior court. With the exception of notaries public and judges of courts of record, officers may attest such instruments only in the county in which they hold their offices ( 44-2-15). If an instrument is executed in another state, it must be attested or acknowledged before an officer listed in 44-2-21, and must also be attested by two witnesses, one of whom may be one of the officials listed in 44-2-21. Every deed conveying lands should be recorded in the office of the clerk of the superior court in the county where the land is located. Georgia has a race notice recording act, which means that a deed can be recorded at any time, but a prior unrecorded deed will lose its priority over a subsequent recorded deed from the same vendor when the purchaser takes such deed without notice of the existence of the prior deed ( 44-2-1). Deeds, mortgages, and liens of all kinds which are required to be recorded in the office of the clerk of the superior court and which are against the interests of third parties who have acquired a transfer or lien binding the same property and who are acting in good faith and without notice will take effect only from the time they are filed for record in the clerk's office ( 44-2-2). Every unrecorded voluntary deed or conveyance of land made by any person will be void as against subsequent bona fide purchasers for value without notice of such voluntary deed or conveyance; provided that if the voluntary deed or conveyance is recorded in accordance with Code section 44-2-1, it will have priority over subsequent deeds or conveyances to the described land ( 44-2-3).